The fully enclosed ice rink is home to Harvey Hockey and offers a variety of instructional skating programs. The arena operates all year long and was built to serve the needs of those interested in skating. We invite you to visit this website often to check the schedules and the many opportunities Evarts Rink has for your skating needs! Evarts Rink is conveniently located ¾ of a mile south of the intersection of Route 35 and Route 22 in Katonah. From I-684 or the Saw Mill River Parkway, take Exit 6 to Route 35 east to Route 22 south. Other organizations utilizing Evarts Rink are the Hickory Hill Figure Skating Club, Bedford-Katonah Youth Hockey, and Bedford Bears Men’s Hockey. Additional ice time is available. Please see our Freestyle Calendar for specific dates and times. Please visit the Freestyle Calendar or download the Freestyle Application for specific dates and prices. Holiday Sessions will be posted in advance. Season Subscribers are guaranteed their place. Any available places will be offered on a first-come – first-serve basis. Sessions are not oversubscribed. Guest Pros – Please notify us in advance when you wish to come and we will let you know how many places are available. All pros must give us a current Certificate of Insurance with The Harvey School listed as additional insured. Times are subject to change, please check with rink or the Freestyle Calendar. Please send your child to the rink with the appropriate fees, or make arrangements with the front office for payment. Billing is not offered. Weekdays, Monday - Friday, 9:00 a.m. to 5:45 p.m.
Saturday and Wednesday Evenings, 6:00 to 7:20 p.m.
Evarts Ice Rink has been operating a group ice skating lesson program for more than 30 years. Learn To Skate USA for SPS 1 through Freeskate 6 is sanctioned by United States Figure Skating (USFS). Classes are taught by qualified and nationally certified skating professionals. Lessons are run for eight weeks. Formal instruction will be 30 minutes. Ample practice time will be provided before and/or after the lesson. Skaters who have progressed to the next level will receive USFS badges on the eighth week of lessons. Please Note: Some levels are difficult and may take a skater more than 8 weeks to complete. Students must be pre-registered. Click here to download the Group Lesson Application. The cost for the program is $180 for an eight week session. Additional immediate family members receive a $15 discount. Fees include a one-half hour lesson each week for 8 weeks with practice time before and/or after the class. No MAKE-UPS are allowed. Refunds will be given after the first class only. If classes are cancelled due to inclement weather, the session will be extended an additional week. All skaters must have their own single blade skates — skate rentals are not available. Beginners and Tots should wear helmets (Bike helmets are fine). All skaters should wear mittens or gloves, and dress in layers. For beginners and tots, waterproof pants are suggested. Please check skates for proper fit and sharpness. If necessary, our staff will be happy to help you check. Please arrive early and dress in the rink, not in lounge, lobby area, or on the stairs. Heated locker rooms are available. Class rosters will be posted as you enter the rink. Find the time and the name of your teacher. Classes are held at one side of the rink—practice time on the other. Please do not leave your child(ren) unattended at the rink. For cancellations due to inclement weather, call (914) 232-3618. Immediate family members only may skate in the practice area for a small fee as space allows. Private lessons are available at the rink. Please call the office at (914) 232-3618 for more information. From I-684 or the Saw Mill River Parkway, take Exit 6 to Route 35 east to Route 22 south. 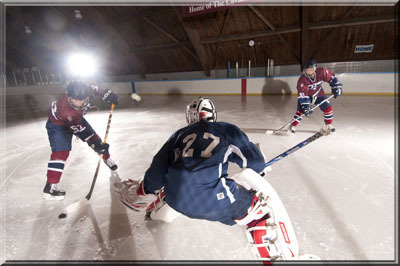 The Evarts Rink is conveniently located ¾ of a mile south of the intersection of Route 35 and Route 22 in Katonah.